Major Drop, Pestle & Mortar- these are among the two prides and brainchild of Feixiang and his team. As the label turns 4 this year, Feixiang shares about his personal journey and worldview on various aspects in life. Trust us, you’re never be the same person after reading today’s Featured Interview! Enjoy! 1. Hi Feixiang, please tell us more about yourself! Hello, my name is Feixiang. I’ve been passionate about business, sales & marketing since I as long as could remember. I remember my first “business”- selling cut out prints of jet planes that I printed at home to friends for a small fee. You learn to hustle when you’re lacking in life. Growing up, I’ve enjoyed the process developing and executing ideas and turning them into things that you can experience. That’s why I started my career at a boutique creative agency, because I believed that would have been the best place to learn quality experiences and best pathways to grow. I wasn’t wrong. 4 years later, here I am today with Major Drop working on brands and growing the business within the street-lifestyle fashion industry. I’m still a work in progress. 2. For starters, can you let us know what is Major Drop, and what is your inspiration behind it. The inspiration behind Major Drop isn’t exclusively mine. It’s driven collectively by the team that brought you Pestle & Mortar Clothing. It’s a work in progress; a journey of growth towards the ever-changing landscape of retail. Major Drop was started in 2014 with the aim of supplying specially curated and quality driven street-lifestyle brands from across the globe. We don’t aim to sell just clothes, but creating a lifestyle that resonates with our Homies (customers). We curate special events at our stores (artist/brand owner meet ups, sneaker customization clinics and so much more) that look to create a unique experience at Major Drop. MajorDrop.com is where you can find your favourite brands anytime from anywhere around the world. 3. It is not easy to start up a business, what were the toughest challenges you’ve faced in your entrepreneurial journey, and how did you overcome them? As I write this, there are challenges now, there were challenges yesterday and there will be challenges tomorrow. So, it’s difficult to really explain the toughest, because during the time, they all seem to have been “the toughest” – it’s really about perspective. One should understand that it’s part of the journey, that problems don’t necessarily get easier, but they get less complex. Every hurdle is an opportunity to learn and allow you to minimize the f*ck ups. I remind myself everyday, keep moving, keep learning and continue to be a solutionist – stop complaining. 4. As a leader and business owner, what are your views towards youth these days in terms of their working attitude? I turned 29 in 2018, so I’m not that much older than ‘youth’ coming into the workforce. However, it’s a terrible thing to generalize because I’ve seen and experienced people much older showcasing unpleasant attitudes and quality of work too. I believe the youth today are smart, but they could really benefit from learning that hard work still pays off – learning how to grind and endure tough times is part of the process. A shift into that thinking and attitude makes a better individual. 5. In your very own definition, what lifestyle means to you. Lifestyle is everything that represents you and your values. It’s really how you’d like to live and what best represents you. 6. What makes a great team? Open and clear communication. A willingness to respect and constantly encourage each other – not only during the good times, but also during the most challenging ones. 7. Can you share a tip or two to those who are interested to become an entrepreneur someday? Find a good partner – it’ll be more worthwhile than undertaking things alone. Don’t follow the money, find a way to make the world a better place. Money and wealth is the by-product of making a really good idea work. 8. You are also a boxing enthusiast, but what makes you choose to dabble in boxing instead of other sports? I just picked up the sport 6 months ago. I was previously into Powerlifting and Olympic Weightlifting. I needed a change in routine. A new sport gives me new knowledge, new skills, new mindsets. These helps to put things into new perspectives in my everyday life. 9. With a huge role to play in your business, how did you manage to maintain your work-life balance? Know when to shut off. I recently picked up this quote, “What’s the point of making a living when you’re not truly living?”. Spending time at the gym in the evenings and ensuring that I spend time with family over the weekend helps create the right balance with things. Life’s too short to always be working. 10. Are there any exciting plans for Major Drop that we all can anticipate in months to come? Co-creation at a new level. Can’t say anything else beyond that. 11. If you are not an entrepreneur, what will you choose to do and why? I wouldn’t call myself an entrepreneur. I relate more to being an intrapreneur at this stage – someone helping with growing the business at a clear strategic and management level. I wouldn’t be doing anything else to be honest. I don’t like to contemplate on the what if and if not. 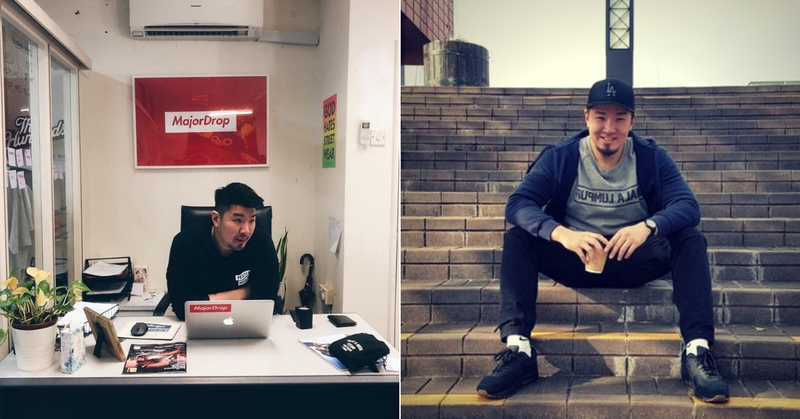 Follow Feixiang and his team at Major Drop, Pestle & Mortar Clothing on Instagram for their latest drops!